As the Hound once said “your friend is dead and Meryn Trant’s not. ‘Cause Trant had armor…and a big ****ing sword”. Having a good set of armor is clearly a necessity when it comes to war, it’ll make the difference between life and death. Not all armor is a combination of heavy plates of steel, some favor mobility or ceremonial aesthetics. It all depends on where you come from if you’re a normal soldier, men with gold in their purse have the fortune of getting armor custom made for their preferences. This list will look at the top 10 best armor seen in the Game of Thrones TV show, for both individual characters and standard army foot soldiers! Ser Loras Tyrell was famous throughout Westeros as the Knight of Flowers, immediately recognisable by his armor. The metal is littered with roses, the sigil of his house. It’s obviously made to fit, allowing Ser Loras to stay safe while remaining mobile. However, the helmet is quite silly as it’ll limit visibility severely and for this reason, it only makes number 10 on this list. Mormonts are said to be great fighters, the former Lord Commander of the Night’s Watch Jeor Mormont was a battle-hardened warrior and his son Jorah is no different. His armor bares the sigil of the house he betrayed but you can tell he’s still loyal and his armor reflects this. An advantage of being much taller and stronger than almost everyone else is being able to wear bigger armor. Sandor Clegane’s old armor had plenty of plate, leather and chain to create a strong yet dexterous set of armor. It looks extremely badass too, the Game of Thrones backroom staff got this spot on. Although Theon’s Greyjoy armor is the best of them all, the ordinary soldier attire is one of the coolest looking armor sets in Game of Thrones. The mixture of dark colors suits the Ironborne well and the kraken sigil is intimidating to behold. Theon’s variant is pretty much the same as all others, except his has shoulder plates & slightly lighter colors. Renly was never going to be a great warrior, his armor had to be a bit more attractive than effective in battle. You could argue it shouldn’t be on the list because of this reason but I think the awesome appearance warrants it a place in the top 10. Thinking about it, Ser Loras Tyrell did wear this armor in the Battle of the Blackwater, so it can’t be too bad in combat. That may be due to Loras’ combat proficiency though, rather than the defensive abilities of Renly’s armor. The Tower of Joy flashback was our first look back into the times of Targaryen soldiers and my god was their armor awesome. We don’t exactly know if this was ordinary infantry armor or kings-guard armor but it looks epic. No fannying about with colors & cloth, just straight up hardened steel with a Targaryen sigil. This is everything a set of armor should be. I’m putting the gold ‘Baratheon’ kings-guard armor instead of the new ‘Lannister’ armor due to the helmet of the latter armor. Honestly I think that helmet is silly but the pre-Lannister armor was incredible. The chain-link scales are seriously under-utilised in my opinion, this armor looks effective enough to help protect kings-guard members yet beautiful enough to be ceremonial. Gifted by Jaime Lannister, both Brienne and the viewer were amazed at the glory of this armor. She puts it to good use as well, having fought many times since she first put it on and barely picking up a few scratches along the way. This was demonstrated during her fight with the Hound, she would probably have lost the fight if she had weaker armor on as the Hound gave her a good beating that she just managed to stand up from. 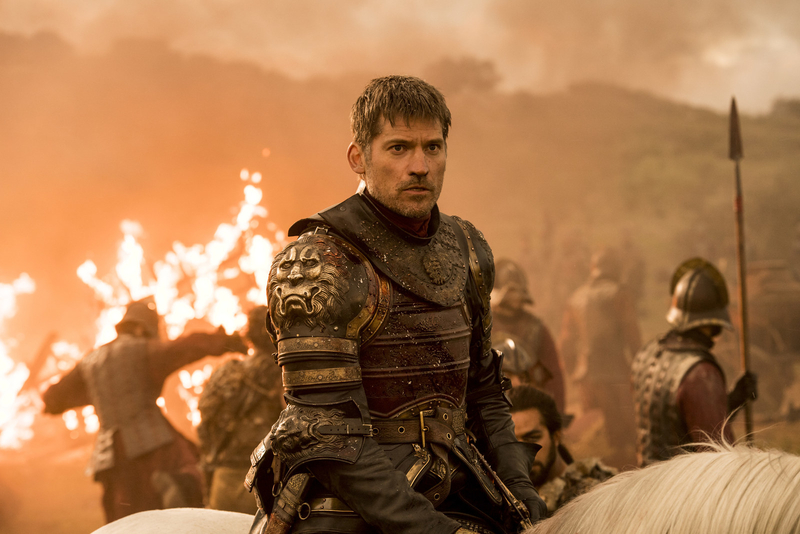 Well, not just Tywin’s armor but Jaime’s too, they appear to be the same armor. The Lannisters have been the true power of Westeros for many years and over those years, Tywin has been collecting the greatest blacksmiths in the realm. If you’re told to create a suit of armor for Tywin Lannister, you have to do it well. The words of House Lannister is “Hear me roar” so you’d expect their armor to be covered in lions and other art. Overall it looks wildly effective in battle while retaining a ceremonial appearance and truthfulness to the house its wearer belongs to!